The premise of Ever After High is that it is a school for the children of fairy tale characters and they split into 'Royal' and 'Rebel'. The Royals are the children of straightforwardly good characters for example Apple White who is Snow White's daughter. The Rebels are for the most part the children of baddies, like the Evil Queen's daughter Raven Queen. The problem with the Rebels is that the second generation seem to have a few questions about the destiny of someone who causes harm to others. They 'rebel' against their future and reject it. This in turn makes the good characters panic because if there is no baddies placing them in peril how are they meant to have their wonderful destiny? All this is by the by because the character above is a rather more difficult matter. 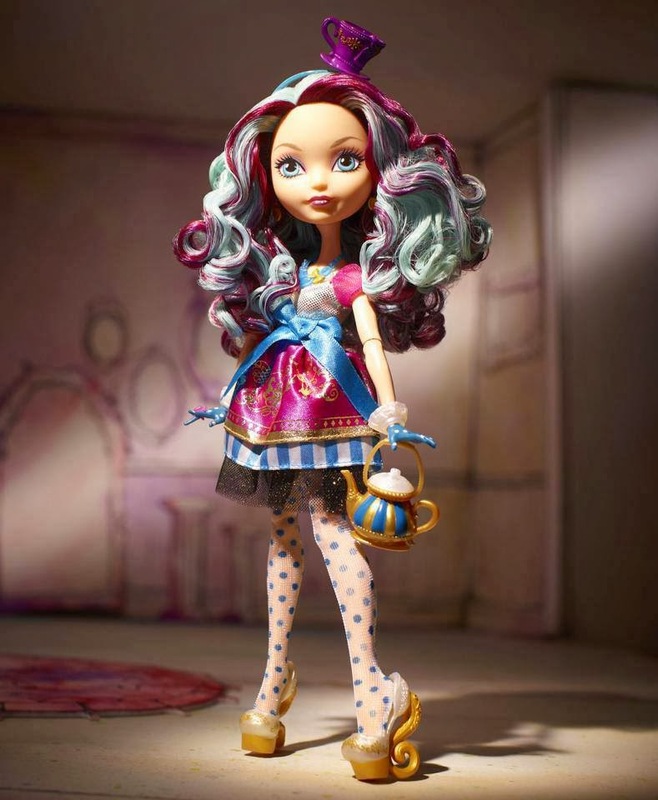 This is Madeline Hatter, daughter of the Mad Hatter. As Bin pointed out (and what sparked my interest) she's listed as a Rebel, but does that mean we view the Hatter as a baddie? Watching the accompanying cartoon webisodes (also available on YouTube here), the idea of the character is that she is a rebel as she supports the idea that everyone can choose their own destiny. However, she also embraces her destiny as a tea shop owner (I know, I know). On the whole, the Rebels all share parents who were overtly evil or came to a bad end. 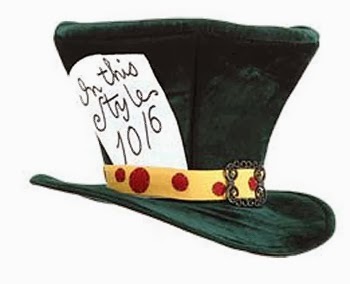 Do we now view the Hatter in this way? 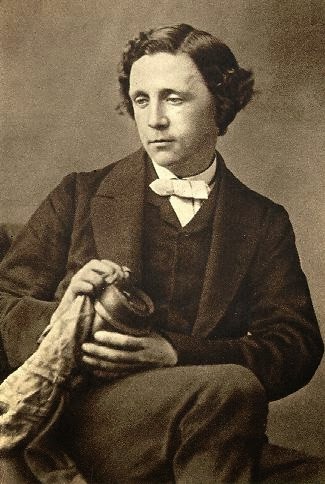 What did Lewis Carroll intend us to feel about the Mad Hatter and how does that differ from what we feel now? 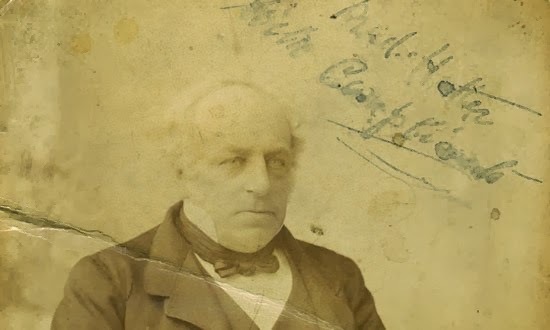 This chap is Theophilus Carter, a furniture dealer in Oxford who would tout for business by standing in his shop doorway wearing a top hat. He was known as The Mad Hatter. Allegedly John Tenniel, who did the original illustrations for Alice (as seen above) used him for the model for his namesake. Sadly, he is not wearing a hat in the picture. Shame. So what did it all mean? There are no doubt more explanations for Alice than there are stars in the sky but thinking about when Carroll wrote it I like to think it was either a story to do with growing up or to do with madness. I can see how all of Alice's strange questions and confusing situations must seem like becoming an adult for a little girl. Suddenly things do not make sense, things seem both magic and horror, and everything is vivid and threatening. It could also be about how childish things have to be left behind, which is possibly how Carroll saw his own relationship with his little friends. What ever you might think of Carroll and his child-friends, I can never see any hint of the pedophilia he is so often accused of in Alice. The other explanation I have for Alice is that it expresses a fear of being the only sane person in a mad house. The Victorian's feared madness, its unpredictable nature, its family curse, its shame. I am surprised I can't name any piece of Victorian fiction of a sane person mistakenly imprisoned in an asylum (although I love that aspect in a neo-Victorian novel I won't name because it is the huge twist in the tale), but I don't doubt there is probably a piece of Sensational fiction that had that theme. Alice is deemed 'mad' simply because she is in Wonderland. Everyone in Wonderland is mad, says the Cheshire Cat, and you are here, therefore you are mad. That is chilling in its simplicity. If I may take a moment and dazzle you with my youth, I was born in 1973, so I find it impossible to imagine my childhood without Alice in Wonderland and Disney's interpretation of it. Although we bemoan the Americanisation of many British Childhood classics, Disney preserved books like Alice in the mass imagination so that reimaginings, reinterpretation and the suchlike could take place. I grew up with the cartoon, it drew me to read the book, but I'm sorry to admit that I was somewhat scared of the Hatter as a child. He is overtly mad, unpredictable and a little bit threatening (or at least I thought so as a child). 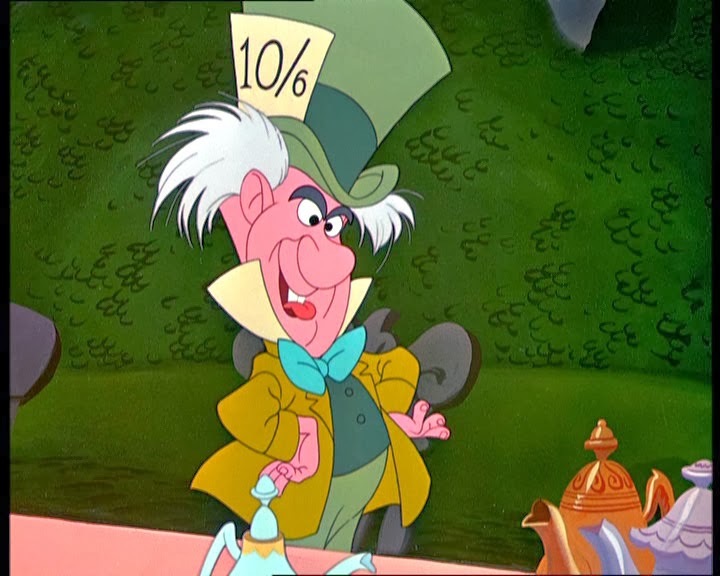 I don't think it's a coincidence that one of Disney's recent bad guys owes a lot to this Hatter both in looks and voice (again, no names, no spoiler). You can see where Disney took inspiration from Tenniel's original design: big head, big hat, big, braying mouth. He's loud, opinionated and dangerously happy. He is white-haired, old in appearance if not in behaviour and he is definitely a part of Wonderland. In the hands of Tim Burton, Alice in Wonderland finds a different path, albeit a sympathetic one. 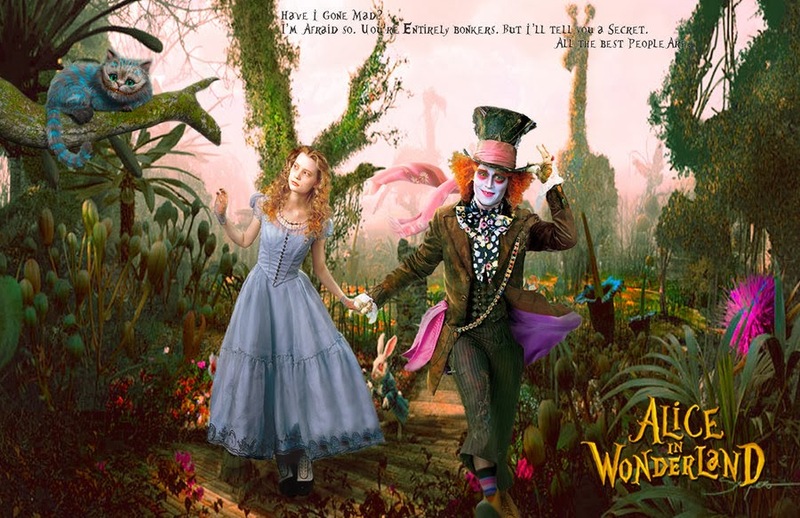 Not a straight adaptation, it is one of a series of 'return' films, where the now adult Alice returns to Wonderland to sort out the mess that has arisen. The Hatter (who has a name, Tarrant Hightopp) is openly deranged, on the edge of sanity, expressed by his random outbursts in a 'Glaswegian' accent. Mr Depp believed the character had been poisoned by his craft (which he discusses and does in the film) and the mercury is seeping out through his electric coloured eyes and unruly hair. I thought that his random bursts of Scottish were referencing Elizabeth I (in the form of the Red Queen) and Mary Queen of Scots (the White Queen), lending an air of the tragic, romantic struggles of royals in the past. The Victorians would have loved that. 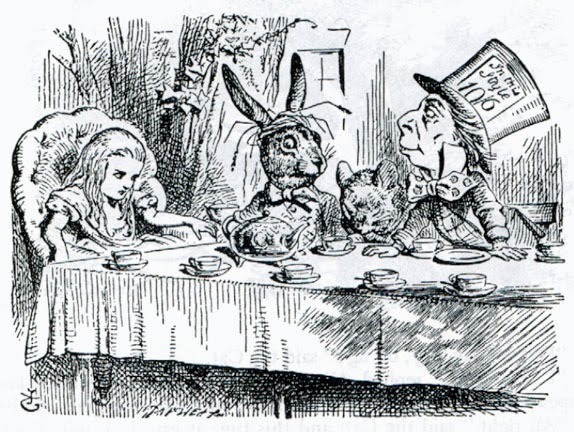 Here starts a thread that is very prevalent in the Alice story now: Forgive me if I'm wrong, and please tell me because I find this interesting, but before the twenty-first century there was not a hint that there was any romance between the Hatter and Alice. I suppose this was mainly because she was a 10 year old girl and he was an unhinged grown up. When you revisit Wonderland with an adult Alice then a whole host of other things come to the table. A common thread in all the 'revisiting' stories to do with Wonderland is that Alice was so affected by her first trip down the rabbit hole that she has been unable to build a normal life in the meantime. Once back in Wonderland, Burton's Alice is able to take control of her destiny in a way that Victorian society won't allow her. Maybe because of her alienation from real life, maybe because it's Johnny Depp, but it becomes inevitable that Alice becomes romantically involved with the only other human in the mad world. 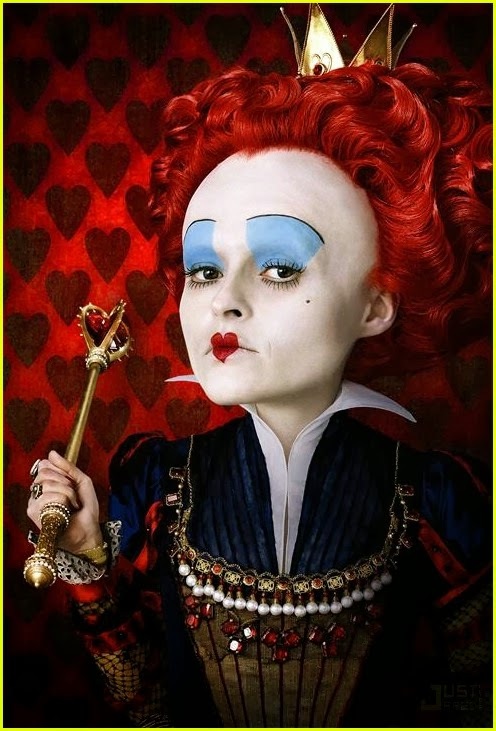 In Burton's film it is coy and sweet and Alice leaves Hatter in Wonderland once more at the end, despite his proposal. In Syfy channel's Alice, things are a little less teasing. Word cannot begin to describe how utterly bonkers this version is. Predictably it has more of a science-fiction edge than Victorian children's fantasy, but it is wonderful. Alice and the Hatter join forces to liberate Wonderland from the clutches of the astonishingly splendid Kathy Bates (with the most amazing frocks I've ever seen). They fall in love, he goes back to the real world with her. That brings up a lot of complex tax implications to my mind. 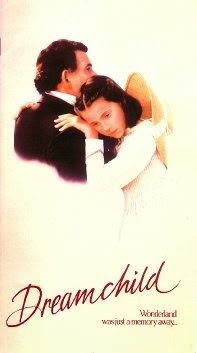 Dreamchild (1985) tells the story of the 'real' Alice and her relationship with the fictional Alice and Lewis Carroll. Carroll was obviously very attached to little Alice, whether appropriately or otherwise, and maybe some of the recent romancing is a reflection of Carroll and Alice's relationship. 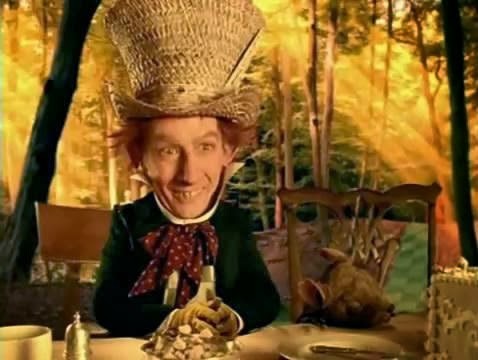 It's a thing of madness and uncertainty, seeming to undo the sanity of the Hatter even further. But he loves her, in a way that is not expressed by the original book. Part of me thinks that Mr Depp is to blame for the romantic feelings we (using Alice as our placeholder) now feel for the Hatter, but maybe some of it is the longing we now suspect that Carroll felt for Alice. So how does all this get us back to a small, wide-eyed doll? From being a player in an ensemble piece back in the 1860s, the Hatter has become second billing to Alice in Wonderland. 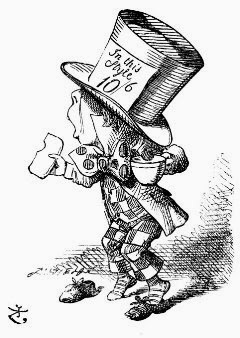 I find it interesting that we call him the Mad Hatter whereas it would seem to be unnecessary to attached the adjective to him. Everyone in Wonderland is mad. 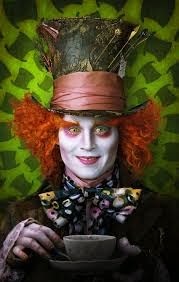 I suppose he is the Mad Hatter because the phrase Mad as a Hatter already existed. So, bad guy or romantic hero? 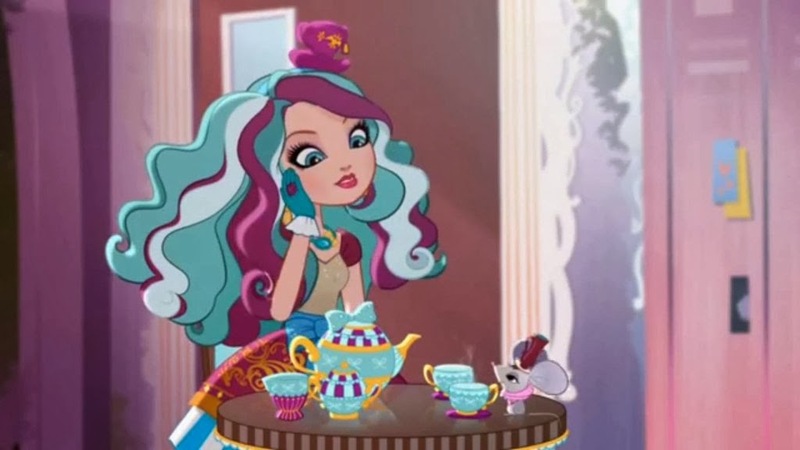 It is an unanswered question why Maddie Hatter in Ever After High is a Rebel, given that the reasons given refer to the destinies of the parents and the Rebels rejection of that. Maddie embraces her destiny. The other reason given is that the parents of the Rebels did not get a happy ever after, so does the Hatter's madness preclude him from a good end? Maybe the uncertainty of the character's position reflects the unpredictable nature of Wonderland itself. It certainly seems beyond the control and understanding of everyone, readers and authors alike. Maybe that's the reason we keep going back. Kirsty, I too enjoyed the Disney alice both as a child and as a student. Thanks Simon. I particularly like Gwen's saucy take on it. Obviously.